There’s nothing like seeing the name of your school scroll across the bottom of the TV screen when the snow starts to fall outside. It means a day of sledding and hot chocolate! But, not anymore. 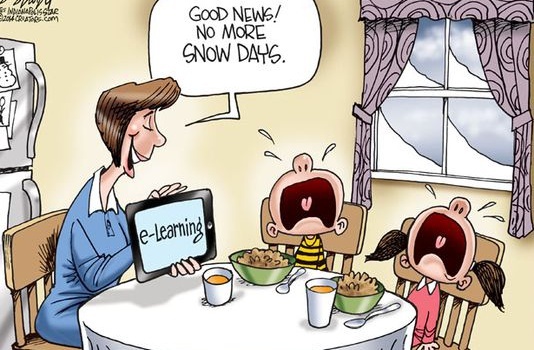 In many states, schools are opting for e-Learning as a way of keeping up the educational momentum that can be quickly lost after four, five, or more days of school closings. Naysayers may first contest that there is no substitute for being with the teacher who can direct the learning and answer questions. However, with the use of an online LMS (learning management system), which works much like an academic social network, the teacher is very much a part of that learning. Using an LMS, like Converge, teachers can do much more than post documents. They can post assignments, upload instructional videos (demonstrating things like how to work that calculus problem), manage an online discussion thread, give quizzes (that are graded in real time), and be available through messaging to answer individual student questions. What can teachers do now to prepare for the upcoming snow days? Get a head start by creating digital lessons that not only contain content but engage students in the learning process. One of my favorite tools for creating such lessons is Nearpod. Speaking from experience, it is one of the best multi-platform accessible tools for delivering information. Take your old PowerPoint presentations and reinvent them with Nearpod. Add interactive slides to the presentation requiring students to engage in learning through drawing, watching video lessons, accessing web links, and best of all answering formative assessment questions. Teachers will see responses in real time and can use this information to redesign instruction as needed. Teachers can also allow students the opportunity to demonstrate their learning through creative tools like Haiku Deck and Thinglink. Create a Padlet board for students to submit digital assignments so they’re all in one place for ease in viewing and assessing. No need to worry, kids, you can still go sledding and have hot chocolate as soon as you finish your schoolwork. Let it snow!